Of all of Disney’s recent animated features, “Aladdin” stands apart from others thanks to its almost irreverent humor and its ability to charm to adults as well as children. The DVD release has the same level of appeal with many features that outweigh the pleasure of watching just the movie, even if a few of them are excessive. “Aladdin’s” story is not much more than the boy-meets-girl formula that dominates a typical Disney feature, but never before has a movie like this been so funny. This is due to not only the star attraction, Robin Williams’ manic Genie, but other supporting characters such as the equally hilarious Iago, the wisecracking sidekick to the villainous Jafar, and even the magic carpet, a character without a face, who has more personality than heroes Aladdin and Jasmine combined. This does not mean the heroes are boring. They are simply playing the straight man and woman in a story filled with many different personalities that we’re not used to seeing in a Disney feature. What also made “Aladdin” different was its updating of what is essentially a fairy tale to give it references to modern life, most of it through the humor of the Genie. When the Genie sports a Goofy cap that could only be purchased you-know-where in the film’s climax we believe it because this Genie has infinite power of the universe and can travel through space and time, even within his itty-bitty living space. Disney lives up to its usual high standard when it comes to remastering its features for any sort of rerelease, and “Aladdin” is no exception. Very few discs will come with a sharper picture. You can try to pick out the computer-generated effects from the hand-drawn elements, but you know animators have done their jobs when this becomes a difficult task. The sound lives up to the same expectations, which is very nice for a movie filled with so many memorable musical numbers, especially with a new enhanced soundtrack. If this is one of those discs that is going to be played over and over to keep children occupied, “Aladdin” has a lot of mileage to offer. 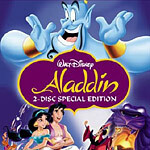 The first disc contains a deleted song called “Proud of your Boy,” a song about Aladdin’s mother, a character who was eventually dropped. There are also a few deleted scenes that are actually rough cuts, one of them being the first meeting between Aladdin and Jafar that comes off pretty awkwardly. You can also watch just the musical numbers with on-screen lyrics if you want to revisit the songs. Which brings us to the disc’s biggest flaw; did they really have to create new videos for this release? Clay Aiken’s rendition of “Proud of Your Boy” is tastefully done and would not be too bad by itself, but they had to bring in Jessica Simpson and Nick Lachey to perform an uninspiring “A Whole New World,” and if you cannot get enough of them, they have a “Making of” video to accompany it. This is painful to watch. Simpson looks like she’s giving birth to a gnu while she sings. The disc will be better enjoyed if the new videos are ignored. The amount of entertaining material on the second disc is quite surprising. A full documentary on the making of “Aladdin” is longer than the actual film and is presented with the option of watching it in its entirety or certain chunks of it. The bulk of the documentary is Disney connoisseur Leonard Maltin hosting a reunion of the movie’s chief contributors with cuts back to scenes filmed during the movie’s production. Perhaps it should be viewed in its entirety if only to see everyone upstaged by a self-effacing Gilbert Gottfried, the voice of Iago. A 20-minute tribute to the career of composer Alan Menken and his many achievements follow the documentary, along with lots of original artwork and a few trailers. A nice touch, but a bit superficial. You can also take a tour with Iago of the Genie’s lamp in a clever parody of “Lifestyles of the Rich and Famous,” complete with Robin Leach’s narration. If you need more, the provided games such as the virtual magic carpet ride are somewhat amusing, even though it takes a lot of guesswork to complete them. The Genie World Tour provides a few chuckles as well. Overall, a very enjoyable experience worthy of all the hours you will have to invest if you want to watch everything including its lesser additions.